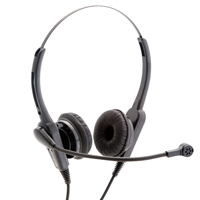 The Agent 400 headset with double earpiece provides superior sound quality, ideal for busy call centres. It has a robust, high quality design and the foam ear cushions mean it is comfortable enough to wear all day without irritation. The Agent 400 headset has an adjustable headband to fit all head sizes and a flexible boom, which can be adjusted to suit your preference.